Wales' home care system is in crisis, a union has warned, as figures show concerns flagged to inspectors has almost quadrupled since 2010. Some 3,861 incidents were recorded by Care Inspectorate Wales (CIW) - compared to 1,014 in 2010. Union Unison Cymru claims patients are at risk and staff, who are not trained properly, are under too much pressure. The Welsh Government said its updated rules provided clarity about when incidents should be reported. But, the older people's commissioner described the figures, which highlight problems including medication errors, as "worrying". Concerns flagged up to care body CIW also include allegations of carer misconduct, as well as theft or burglary from the people they were caring for, according to the data from a Freedom of Information request. The statistics show that since 2015, there were 310 times when police officers were called to the home of someone receiving care. And they also indicate an estimated 203 medication errors reported in 2010/11 - versus 1,026 reports last year. Nigel Rees, who is 51 and from Bridgend, said his frail mother Diane, 82, almost died following an incident in March when he believes carers waited too long to report an infection. She recovered, but Mr Rees said doctors have told him the incident had damaged her health. "I think these carers from time to time need to look at the bigger picture," he added. "It's difficult when the clock is ticking and they've got calls to do. They can have up to 20 calls a day." The home care company involved, Abacare based in Swansea, said the incident was referred as a safeguarding issue to Neath Port Talbot Council, which found no fault against the carers. Unison Cymru, which represents many home care workers, estimates a quarter of home carers have not been given proper medication training. 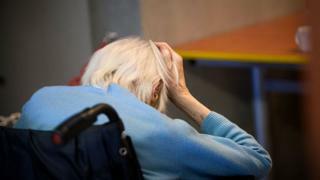 National officer Matthew Egan said: "The home care system is in crisis. "Elderly and disabled people are not receiving the care they need because the workforce are under too much pressure, they're not well supported, they're not well paid enough and they're not trained enough." Mr Egan also said the majority of workers did not have enough time for jobs - even though their clients may have a range of complex needs. "It's bad for the workforce and it's bad for the people receiving care," he added. Industry body Care Forum Wales said pressure on the system has led to poor vetting, training and support of home care workers. Chairman Mario Kreft insisted the majority of workers did a "fantastic job" at the "lower end of the pay scale". But he added the system of domiciliary care "probably needs a fundamental review". Older People's Commissioner Heléna Herklots said: "These findings show there is a worrying trend in the number of incidents being reported. "That suggests that hard pressed care workers are finding it difficult and ultimately [older people] aren't getting the quality of care that we might want." However, the UK Homecare Association said the increase in recorded incidents was not necessarily a bad thing. Colin Angel, of the industry body, said: "It is encouraging that care providers are making more referrals to Care Inspectorate Wales. "It provides an opportunity to understand and respond to situations which can be addressed by the relevant bodies on an ongoing basis." The Welsh Government said the way incidents are reported was changed in 2016. A spokesman said: "This helps support continued improvement to ensure the sector is able to deliver high quality social care for people across Wales."